A while ago, I was introducing the Kanban Kata by Hakan Forss to a team that was struggling to meet their deadline. They had failed twice before and their jobs were in jeopardy. Implementing Continuous Improvement and Kata helped the teams create better processes and remove bottlenecks. I was the coach that took them through the motions that Hakan eloquently teaches, which is based on the Toyota Kata by Mike Rother. The team was able to solve their own problems by getting into a habit of learning. They shipped on time, and kept their jobs. As I was working with the Kanban team, I realized that I was using this process to create successful products. This framework was just much clearer than the way I was going about it in my own head. Before I tell you how to apply this to products and Product Management, let's first start with the fundamentals. Toyota Kata is a Continuous Improvement framework that creates the habit of improving by focusing on learning. It's teaches you how to analyze problems and then create small experiments to solve them. This is the secret sauce that made Toyota great. Every team member was responsible for improving the company's processes. With thousands of people flexing their problem solving muscles daily, they were able to reduce waste while delivering the highest quality. The 4 steps of Toyota Kata are fairly simple. Management will set the challenge while the teams grasp the current condition and establish target conditions. 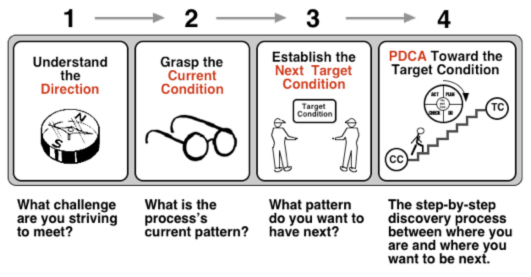 Next, you follow the Coaching Kata to plan the steps to get to the next target condition. The coach is a team member who asks the the following questions during every meeting. The whole team then answers and plans the work. This is a very quick overview, but If you want to learn more about Kata you should visit Mike Rother's page or read his book (which I highly recommend). Hakan took these processes and applied them to improving the Kanban, which ultimately improves you work. I've been taking these principles and applying them to building software products. I call it Product Kata. Following the Product Kata helps us take small steps to learn about our customers' needs, and start solving their problems faster. If you've been at one of my talks, you may have heard about a disaster project I built a few years ago. I was working at an ecommerce company that sold items that celebrity "sellers" endorsed. At the beginning of the year, management tasked my team with building a Seller Portal, where all of the celebrities could manage their own stores. We set out to interview a few of them and find out what they needed. For the next quarter, we built a portal for them and released it. Long story short, no one ended up using it. We really didn't understand their needs from the short time we spent interviewing them. We built them a complicated tool that was bloated with useless features. We ended up rebuilding the portal and eventually found something that they wanted to use. First, we would have understood the direction. It was incredibly costly for us to manage our seller's stores. A quarter of our employees were spending upwards of 15 hours each week on the phone with the sellers to answer their questions. Our management gave us the challenge of figuring out how to make our sellers self sufficient. Now, a note about challenges - they are lofty goals. Sometimes we'll never reach this goal exactly, but we're going to get as close as we possibly can. Direction/Challenge: Make our sellers completely self sufficient in managing their stores. But how do we get there? The first time we built this portal, we jumped to the first solution we could think of too quickly - build them software that does everything. We didn't stop to consider that there are a million unknowns in reaching that lofty goal. We didn't know what the sellers were calling about now. We didn't know their technology habits. We didn't know which ones called more than others. 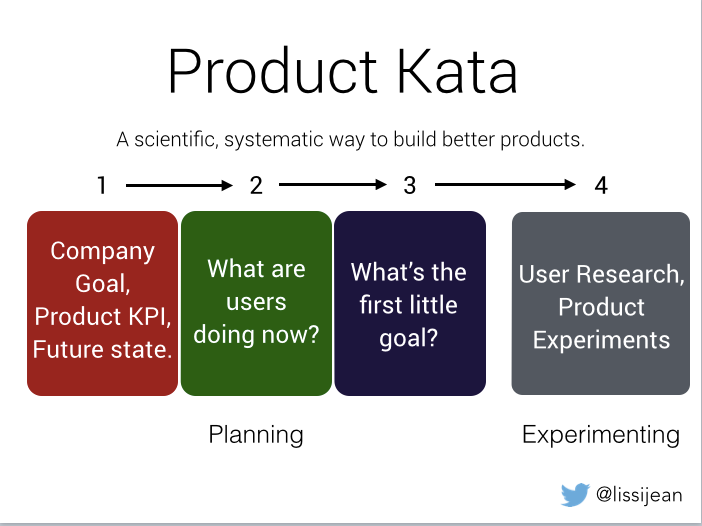 When you run the Product Kata, you recognize that these questions are just obstacles that need to be addressed to get to your next target condition. So what would be our target condition? Since we're not sure how to get to the final result yet, what is one step towards it that we can take. We can start with reducing the number of calls a week, which would help free up our staff. Target Condition: Sellers call office less than twice a week. At the present, they were calling more than twice a week but we weren't sure exactly how much. This was our first obstacle. In order to improve something, you need to be able to measure the change. Obstacle: We're not sure how often sellers are calling now. The first thing we need to do is answer this question quickly. We can ask the staff who answer the seller's calls to measure how often they call for the next week. Right now, we think they're calling about 4 times each per week. Step: Staff measures how often sellers are calling by counting calls over one week. Expected: We believe they are calling about 4 times a week now. When planning experiments, you want to reduce the time between learning so you can move quickly to your target conditions. Steps shouldn't take more than a week where possible. If they do take longer, try to break them down. What did we learn? In reality, the curators were calling 7 times per week, almost double what we thought. Woah. Learned: Sellers were calling 7 times per week. We then measured our current condition again and found out nothing had change. We hadn't met our target condition yet so we asked ourselves what obstacles are we facing now, and continued experimenting. Current Condition: Sellers were calling 7 times per week. Is the target condition met? : No. We learned more about why the sellers were calling and which were the most frequent asks. Now we were able to start solving their problems. SIDEBAR: The first three iterations of here we weren't experimenting because we still did not have data around the current condition. We had to clarify exactly where we are what problems needed to be solved before we moved on. This is a step most people miss when they start experimenting. They will jump in without making the current condition very clear. We tackled getting them to call less for revenue by providing them with a weekly email. We found out they wanted a more frequent update, especially when they had a lot of sales going during that week. Most of the time, the sellers were not putting new sales out but every once in a while they had a booming week where they launched a bunch of new products. They wanted to know the return on them every day so they knew which ones to promote more to their audiences on social media. Current Condition: Sellers are calling 5 times per week. Obstacle: Have sellers call less for revenue. Step: Staff would provide the sellers with a weekly email about their revenue. Measuring amount of calls abotu revenue over two weeks. Expected: The sellers will stop calling for revenue all together. Learned: Sellers want revenue updates every day so they can promote the best sellers on social media. It's also important that every step you take, you also say how you will measure its progress. A step with no measurements can't tell you if you are improving. Providing them with their revenue every day through email cut down the phone calls to three times a week. We continued experimenting like this until we got it down to once a week, freeing up many hours for our staff to work on other things. If you look at these steps, you will see that we weren't building new features for the sellers. That would have taken a lot of time, and we wanted to learn quickly. The biggest mistake we made at our first pass of the portal was including monthly revenue, but not daily revenue. Every seller was pissed off by this, but it took four months to learn. With Kata, we learned this in a matter of three weeks, and we were able to include it in a wildly more successful future version. Learning is one of the most important parts of the product development cycle, but too often we skip over these steps and just rush into creating products. When we work with Product Katas, we can address each thing we need to learn and then incorporate that into the final products. Not only is this a faster way of working, but we have a much better shot at getting the product right the first time. This was an incredibly brief blog post and I didn't have the space to go over all the nuances with planning Product Katas. If you have any questions please comment below and I'll answer them. If you want to learn this way of working, reach out to me at melissa@produxlabs.com.